‘Security Tokens’ are buzzing in the cryptosphere. So much so, that if you haven’t heard of them yet, you probably are missing on a lot. It started with protocol coins like BTC, ETH, NEO, etc., and then moved onto utility tokens such as Fatcom. And now it is the time for security tokens. Security tokens are crypto tokens issued to investors in a token sale or ICO for the exchange of their money. Crypto tokens that pay dividends, share profits, pay interest or invest in other tokens or assets to generate profits for the token holders are deemed as ‘security tokens’. Today’s agenda, however, is to discuss Polymath, a security token issuance platform that we have covered briefly on CoinSutra in the past. Here is A Look At The Top 5 Security Token Issuance Platforms. We all know ICOs or token sales are the new way of financing but many ICOs or token sales have been flagged as securities by the US SEC. Moreover, businesses and cooperations that have tried to get regulated by the SEC for launching security tokens have had a tough time. Tough time because the process is cumbersome and unclear, given the SEC is dealing with such tokens for the first time. Sensing this problem, Polymath, a blockchain protocol for launching specifically security tokens has been conceived. Here is a simplistic video explainer of Polymath. As you just saw in the video, Polymath makes it easy for businesses and issuers of financial products to launch security tokens on the blockchain, thus helping them bridge the gap between traditional securities and blockchain-based asset ownership and investment opportunities. 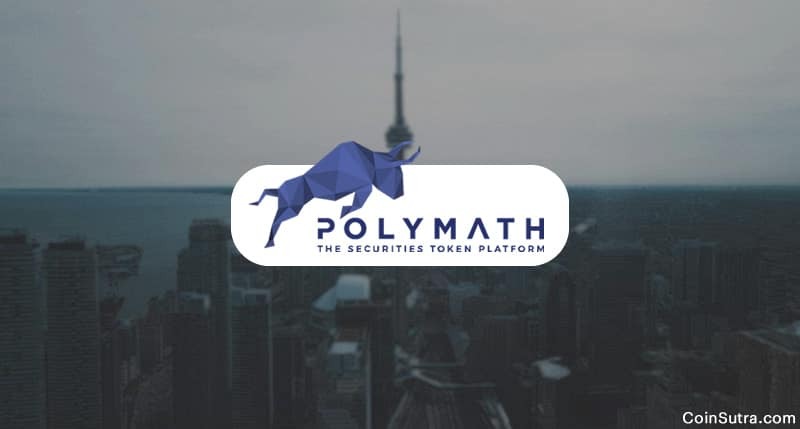 Polymath makes it easy for all the participants to issue security tokens in a collaborative way, thereby saving time and money for the business that would otherwise be wandering through the jungle of regulation and deregulation. In short, Polymath is making the technical challenges and legal challenges of launching a security token easier and more systematic to implement. Polymath doesn’t have its own blockchain. Instead, it has its native token POLY, an ERC20 token thriving on the Ethereum blockchain. Issuers: They post bounties in POLY token to encourage legal delegates and developers to bid on providing services towards the token issuance. Developers: They earn POLY for creating smart contracts for the STO and token in general. 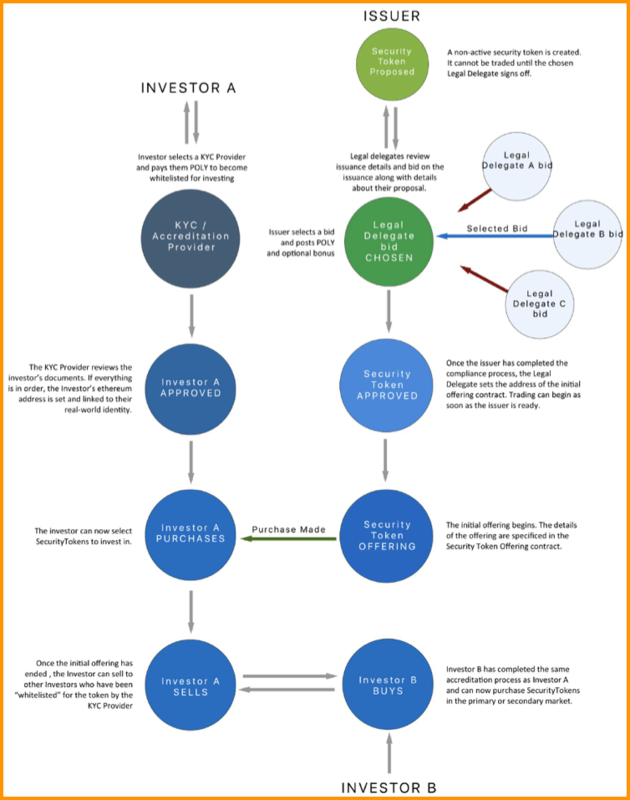 KYC Provides: They initially pay a fee fixed in POLY to join the network. Later they can start accepting POLY as fee from investors who wish to get verified. Investors: They can pay in POLY for their verification fee and also invest in security tokens through PLOY tokens. Legal Delegates: They earn their fees in POLY tokens for their services. 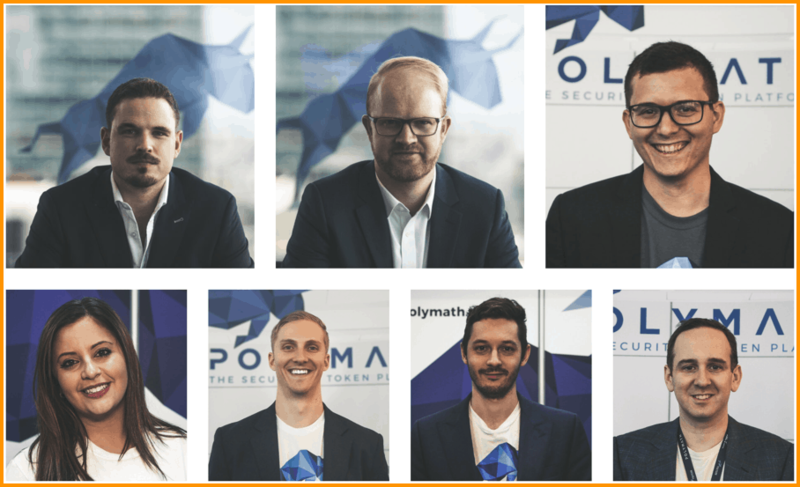 Polymath also has its own ST-20 token standard that the team plans to use for their issuers to launch complaint security tokens in a security token offerings (STOs). The team comprises of developers, legal personnel, and advisors who understand that regulations about securities. The team members are listed here. Polymath has an initial total supply of 1 billion tokens and it raised its ICO for a valuation of 96 million which is huge. As of now, out of those 1 billion tokens, 276,420,107 POLY are in circulation. Every token is valued at $0.29, that sums up to $81 million in market cap. POLY is an ERC20 token, so you have plenty of options for storing your POLY tokens safely. Some of these options have been listed below and will help you keep your POLY safe. Polymath believes that their new ST-20 token standard with their innovating processes will launch an ERC20 token-like stampede, something similar to what we saw during the utility tokens uprising. Plus, they want to be the benchmark for tokenization of stocks, bonds, and other types of securities which have limited functionality on paper or digital form. Polymath is often confused with Ethereum, but they are both very different when compared to each other. Plus, Polymath is not an exchange. It is a security token issuance platform but for liquidity and secondary markets exchange it has tie-ups with security token exchanges like tZero. I feel if they succeed in propagating this method and big funds start converting their traditional shares into tokens, it will initiate a multi-trillion dollar tsunami in the crypto world. But so far, the story hasn’t been all rosy. If you have any questions regarding Polymath, feel free to ask in the comment section below!